I finished this off earlier today, the blade is from a bone from a pet shop. 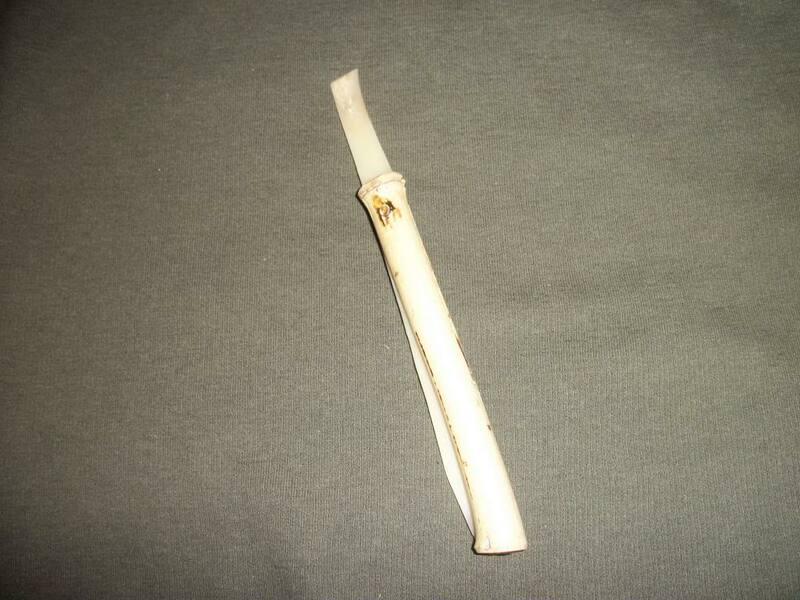 The handle is holly, and both handle and blade were polished with some slightly coloured beeswax polish. 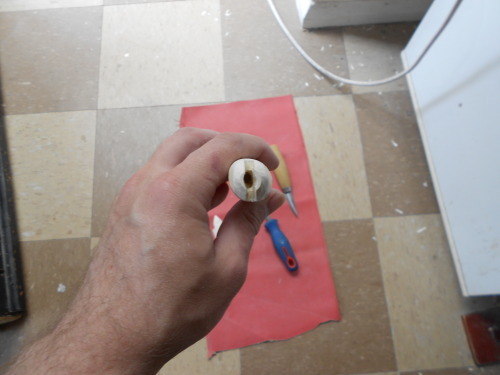 I finally spliced my sinew into a longer piece and used that with some ppg for hafting. I have a few more photos and may share some of the process etc when i get a chance later.... the edge is pretty sharp, but the point is the most dangerous bit. holly can be a nice wood to work with but can crack easily as it dries. 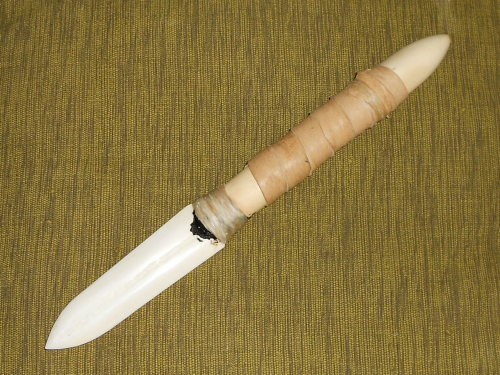 the bone blade is a good idea - did you see the thread a while ago about slate knives? pretty smart but more for looks than function I think. Holly polishes up gorgeously, and i love the really pale woods but you are right about how slowly it dries, and it's susceptibility to checking and cracking. Ive collected holly for sticks and such and usually let it season for at least two years and sometimes three, cutting way over long to compensate for loss from checking and painting the open ends. It will still crack though and can also lose a third of it's thickness as it dries, even when cut in winter. Once peeled it will also crack around the nodes as well even when it's been left over two years. I've had lovely holly stick that i've been really cautious with and still had them develop cracks. Regarding Bone though, it would have been widely used in prehistory, it just doesn't survive underground very well to produce finds. It is very sharp at the point and certainly pretty sharp on the edges and very practical. While making one is time consuming, it takes a lot less skill to do so than a stone knife and is very durable and easily resharpened. Lots of places had little or nothing in the way of knappable rock too yet loads of bone from their kills. I'm pretty sure that you could butcher and skin a deer with it, stab the bejayzus out of pretty much any beastie and do all manner of camp/woodsy tasks with it. Bone would be great for spears too - i tapered the pommel end for theorical fitting in to an antler socket so it could be a foreshaft. Bone spears and harpoons were pretty common back in the day too, could be a good project to try one of these. I wonder how long it would take to make one? With stone tools it'd be quite a job and i guess they would be made when the bone was fresh and easier to carve/scrape. My blade was just hacksawed to a basic knife shape, and then sanded on various grits pressedflat to a table top, similar to honing a knife on a stone. Seemed to take forever and kinda fiddly, probably took me about an afternoon to grind the blade. 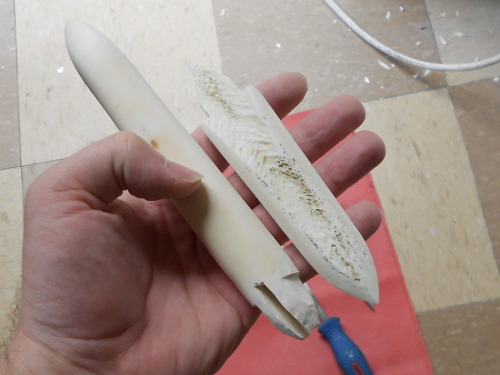 You can carve some very interesting varieties and styles of blades with bone - it's quite versatile. 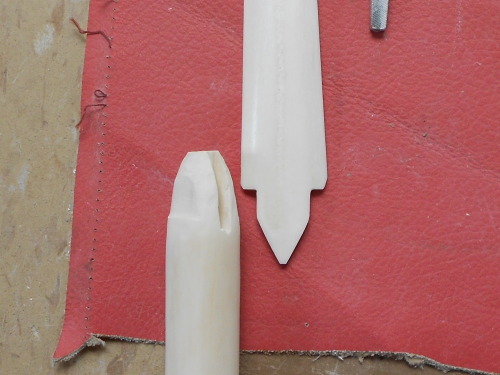 I've started making bone spikes for clubs too, and very much look forwards to eventually mounting them in something. To haft it i used a method you mentioned in a vid ie: having a point at the base of the blade that acts like a mini tang, that sits in a hollow/drill hole set deeper than the sides of the notch, to prevent wobble. That short sinew worked really well in the end too and splicing wasn't too much of a pain either. I covered that with a couple of layers of wilko's refined beeswax to protect it. Bone can discolour quite easily so i put some wax on that too. Some of this got trapped in the pores on the underside so that aint so pretty, but i may melt it out and rebuff it. The leather wrap in the finished pic is just temporary and not long enough to fix properly, so i secured it with a small band of sinew. As i designed the pommel end tapered to double as a socketed foreshaft (and i may narrow it further to *eventually* make a spear shaft and socket) a wrap probs aint best so i may do some something else.. some simple pyrography is tempting however anachronous that might be. or maybe i could get some ochre and rub that into some carvings. I'm liking working with bone though and i think it looks good set in holly, which i have a few more bits of, luckily. I think your right about bone been more widely used than flint - our dog s had a bone today and the bits they chewed off were sharp enough for arrow heads without the work. So far in the not knapped knives dept we've come up with slate, bamboo and bone. I wonder what else there is? I'll have to think about digging out my bits of slate and finishing them off sometime - most was from rooftiles so it's a little thinner than i would like but they still make a reasonably effective blade for chopping and scraping. 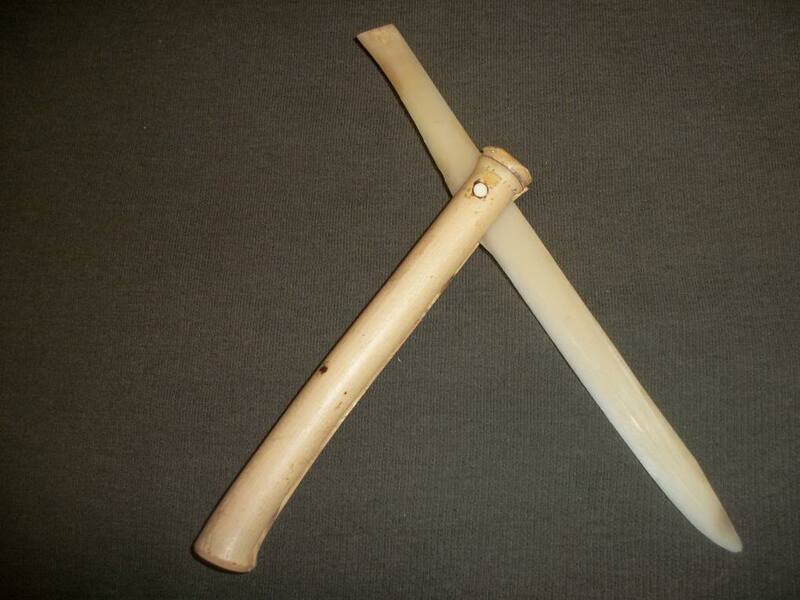 A couple of very interesting Eskimo bone knives. I especially like the second simple but elegant. Nice. 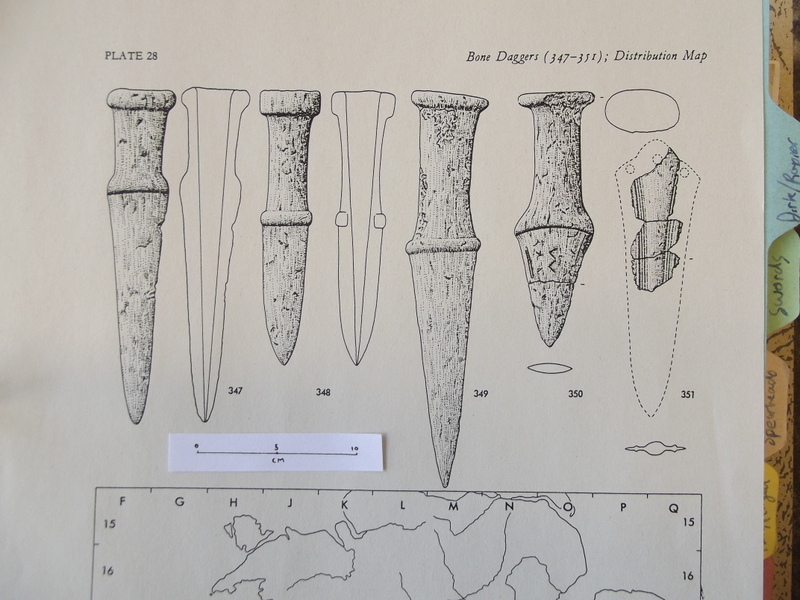 The early bronze age folk had some copies of copper daggers in bone, I think we've touched on this before in beaker daggers. I have two unfinished slate pieces hopefully I'll get round to hafting at some point. After inhaling all the black dust I hope I'll have something to show for my efforts. Tres cool! Flint really is not working for me at the mo, i've broken so much stuff that i've gone back to making preforms to get my eye back in - i'm likely to make more bone stuff in the meantime rather than turn my pile of flint into rubble too quicky. Yep, it's tricky stuff flint. When you're getting somewhere that's when it all goes horribly wrong, keep going though, it gets easier especially with some of the good stuff. I'll post some pics of the E.B.A bone daggers soon. It is just a hump, i made some good progress on glass but figured i was starting to get lazy with it. Flint is a harsh teacher, hence going back to making preforms to re-embed some principles, especially thinking about platforms and strategy and just slowing down! How do you make your glass preforms, do you saw them? Been reading up a bit on bones, they are not all made equal and cooking them has great effect making them more brittle and sharp, apparently pork bones especially so, a rack of ribs could produce a few good knives. i've read differing reports on heat treating bone and it may well depend on variety, but some folk apparantly swear by it while others say it becomes too brittle. It would sure be worth trying though, especially on a skinner or bowie type blade if can find a bone of the right dImensions. Animals that are wild and/or have space to roam have stronger, thicker bone growth too. A butcher not so far from me sells game and less common meats too, I'll have to see if can get some wild boar or kangaroo bone! Allrighty, here are the bone Bronze age daggers that I promised to post a pic of ages ago. The open line drawing next to the first two are the reverse of those daggers and are flat(ish), no. 349 lacks any sections or further views, I would say the illustrator was working from a picture sadly. 350 must be made of whale bone to be that thick at the pommel for a single piece dagger, there is a slight zig zag on the blade which is intentional. no. 351 is the daddy, although fragmentory, but it is clearly a straight copy of a bronze bladed dagger. cool... no 350 looks like a copy of a hafted flint blade too.. maybe i'm getting mixed up but i think it looks like the amesbury archer's copper blade too. It's interesting that this is done (like with danish daggers reflecting bronze patterns too) and implies that makes of bone and flint blades competing with the newer technology either really felt the pressure of this competition or were so taken with the new aesthetic that they wished to emulate it. You can almost imagine the makers trying to hawk them to punters by saying "looks just like the real thing". Ancient Del-Boys with their shonky Rolex's! He he! Very true. It's got to be the case, all are functional too. what type of shop sells bone - is it a craft shop or butcher? From a butcher is fine but it needs cleaning and leaving to season. With the ones i'm talking about i can just unwrap and begin which i really like as someone who has to wait for walking stick wood to be ready! I may try some out on a friend's bench grinder along with some antler for rings - it'll be interesting to see if it actually speeds the job up or just removes the effort. Apart from the large white one, they are all dyed with tea. The biggie may well end up as a spike for a club of some type, and the medium sized ones are probs for projectiles/darts, though they may be ok for arrows. 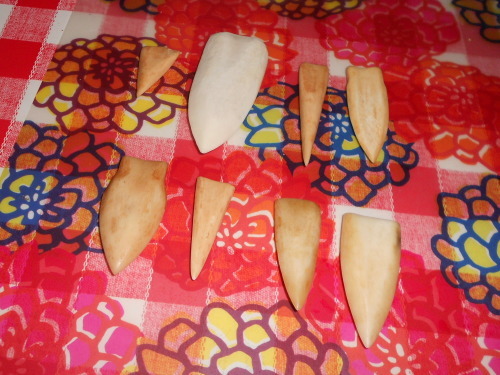 The smaller ones are just from scraps and off cuts and should make good arrowheads.